After a long break I decided to reactivate the blog. This time I have a nnew, even more useless invention – an unusual bluetooth accesory. Most of you probably use smartphones with touch screens, but some people still prefer classic mobile phones. Now you dan dial the numbers from your little notebook just like in the good, old days! The device is based on Nordic Semiconductor nRF51422 chip (NRF51 DK board). It is recognized as a bluetooth keyboard, so no additional software is required. All you need is a phone with Bluetooth 4.0 Low Energy (BLE) support. The firmware is a modiffied HID keyboard example from the SDK, so it took me only about an hour to add a rotary dial support. 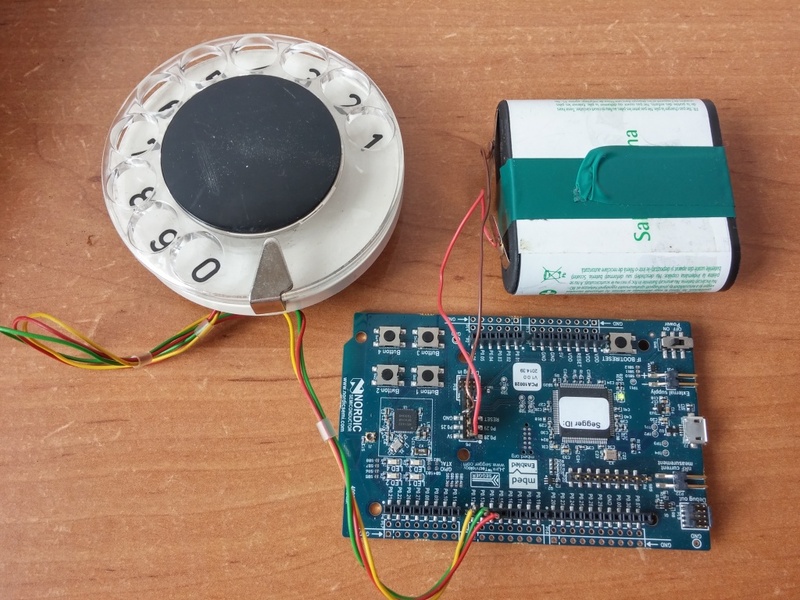 The dial itself which generates the pulse dial signal was taken out of an old phone. The board could be powered from a 3V coin cell battery, but I have connected a large, flat, 4,5V battery because small coin batteries are not hipster enough! You can get the source code below. NRF51 SDK 8.0.0 is required to build(available here). I have built it with Keil 5, but it should also work with ARM GCC or IAR compilers. Rozmiar: 3.65 MB, pobrany 1521 razy.